Yes, there is a National Glazed Spiral Ham Day. A day set aside to celebrate a tender, tasty ham that's been sliced and includes a yummy sugary glaze. Glazed Spiral Ham is a common holiday dish especially for Easter or Christmas. Glaze ingredients may include brown sugar, honey, orange or pineapple juice, prepared mustard, and/or Worcestershire sauce. 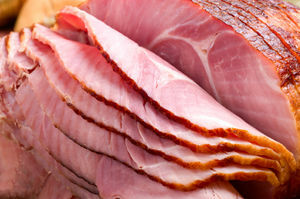 Spiral ham became popular in the 1950s, which was the time a man named Harry Hoenselaar created a machine that could cut glazed ham into uniform slices. In 1957, he founded HoneyBaked Ham Company and opened his first ham store. This page was last modified on 18 December 2013, at 09:06.